Now and then a bit of technology comes out that really catches the attention of the interwebs and the media in general. The bit of technology doing that currently is the rather amazing Raspberry Pi Zero. It's faster than the original model Raspberry Pi (1000mhz vs 700mhz) with the same CPU. It's got more ram than the original Raspberry Pi (512MB vs 256MB). It's much smaller than the other Raspberry Pi models. It uses far less power than any other Pi, approaching Arduino level of efficiency. These advantages add up to make the Zero very compelling. I’ve already replaced my home server (an old Model A) with a Zero as not only does the it use so little power that I can use a spare USB port on the modem to power the it, but I can also just stick it to the underside of the modem due to the tiny size of the thing. BEHOLD! As with any Pi, there are a few more costs than just the bare board to consider when setting one of these up. I got the USB ethernet adapter for Christmas and used a spare micro USB cable for power. I used the same SD card as I had in the old Model A, which is a NOOBS card from the Pi foundation - they cost about £4. Overall I’d say the cost to set one of these up is around £10-15 depending on your use case and how how much stuff you have knocking around the house cable wise, especially considering the £4 kit you can buy from the official raspberry pi store. That price is still very, very low considering what you are getting. I’ve used older model Pis for years and they were more than capable of being media centres or playing old games via Retropie or my personal favourite, RecalBox. The only real problem with the Zero at the moment is how hard they are to find. They are sold out everywhere and even though they came out on the front of a flipping magazine all of those magazines pretty much sold out in a day or two. You may have to wait a few months to find one at a sane price. One thing is certain though, these things are a game changer. There has never been this much computing power available for such a (potentially) low price. 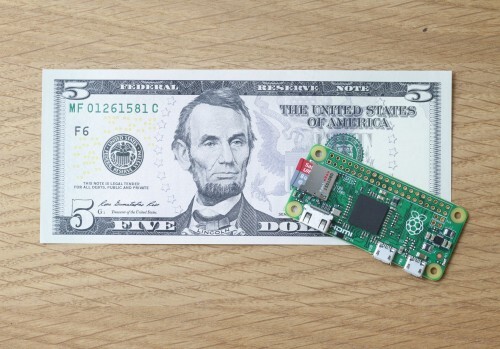 I can’t wait to see what the Raspberry Pi foundation come up with next.